April is a big month here at chez Pickings: we have Mr P.'s birthday, several friends' birthdays and Easter. Hopefully Autumn will actually start to feel like Autumn too. I am so looking forward to some cool weather, and pulling out my many and varied scarves. I hope you've all had a great month, with lots of fun and food in your kitchen. So come along and join in this month, folks! I am breathless with anticipation to see what you've all been up to lately. This one is by Karen Burns-Booth (as you can see), the author of the above-named (award-winning) blog. The name always makes me think of that play with Maggie Smith - Lettice and Lovage, which we saw in London years ago. We were living in the house of Alyson Segal, the interior designer and textile gallery owner who supplied the glorious antique textiles for the play. We were lucky enough to be given a private showing of the beautiful costumes to be worn by the actors. Anyway, I will get back to you about the book when I've had a thorough perusal. 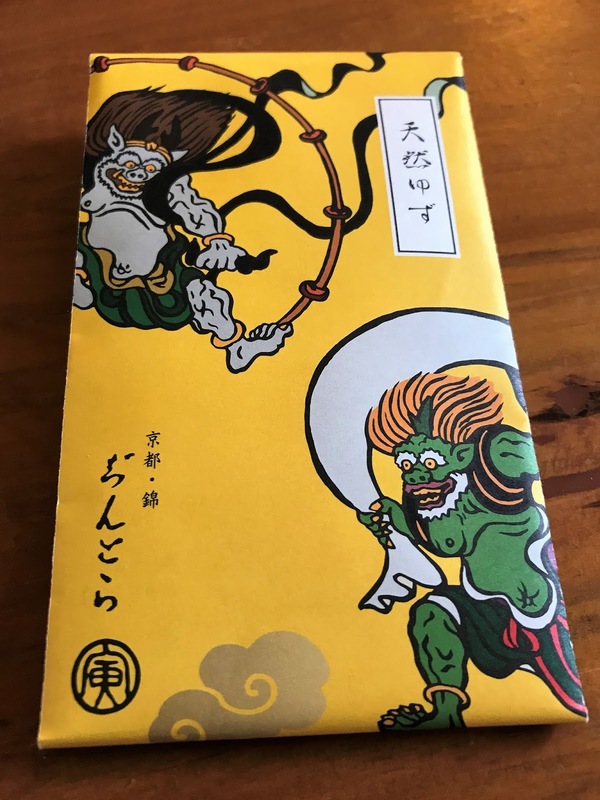 These Japanese demons look a bit scary; hopefully not indicative of the spice level. Not that we mind a bit of heat chez Pickings. yep, "it makes you addicted." Yep, we went to a chilli festival a few weeks ago. All the stalls were selling chilli-enhanced items, including the fudge, and salt and cordial. We had great fun watching some tough blokes showing how tough they were by eating some of the hottest chillies on the planet. The winner calmly scoffed down a selection of chillies, followed by just a sip of milk. Eek! 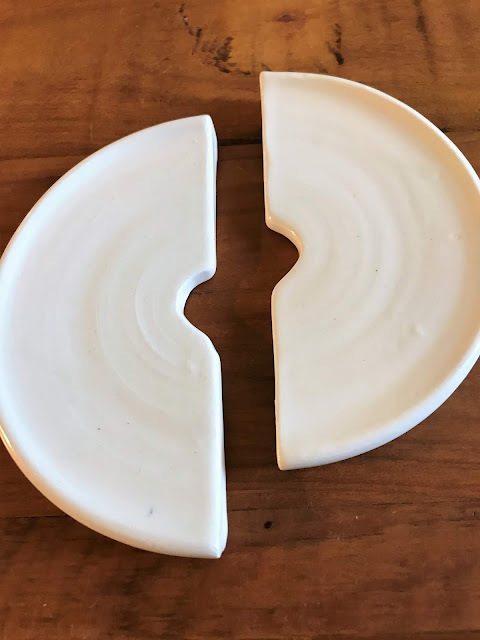 This beautiful dinner bowl by Sit Still Lauren gives me joy, every time I look at it. And I know that's what is important in life, to fill your life with joy. Well, amongst lots of other important things, but you know what I mean. I admit it; I am a cookbook junkie and my shelves are bursting at the seams. Dare I tell you that two more are on their way to my house? Wait till next month for those, my friends. For those of you who don't know about Mirka and Georges Mora, they were European refugees from the Second World War. Mirka narrowly escaped being sent to Auschwitz along with her mother. She became an artist in Australia, and she and Georges started up a number of cafés and a restaurant in Melbourne. They were very bohemian, and were a big influence on the cultural scene of their adopted city. I have tried one of her recipes, and will share that on the blog soon. 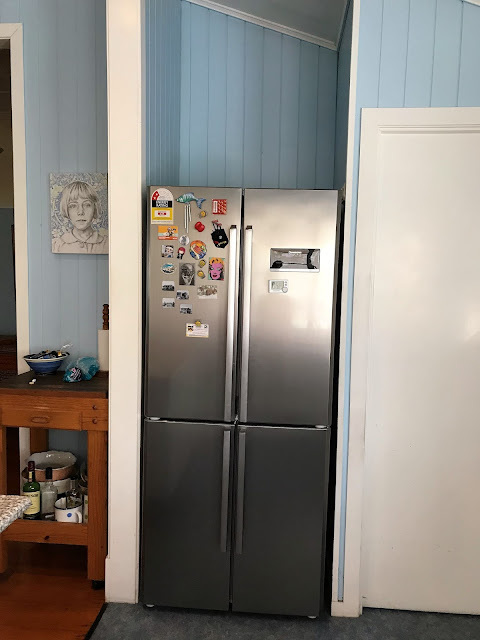 Our newish fridge looks a bit small here, but it is actually a big one that looms in the room (see I'm poetic too:-)) Our old one died a horrible, gaseous, poisonous death, so this new and sparkling and extremely efficient one is a delight. 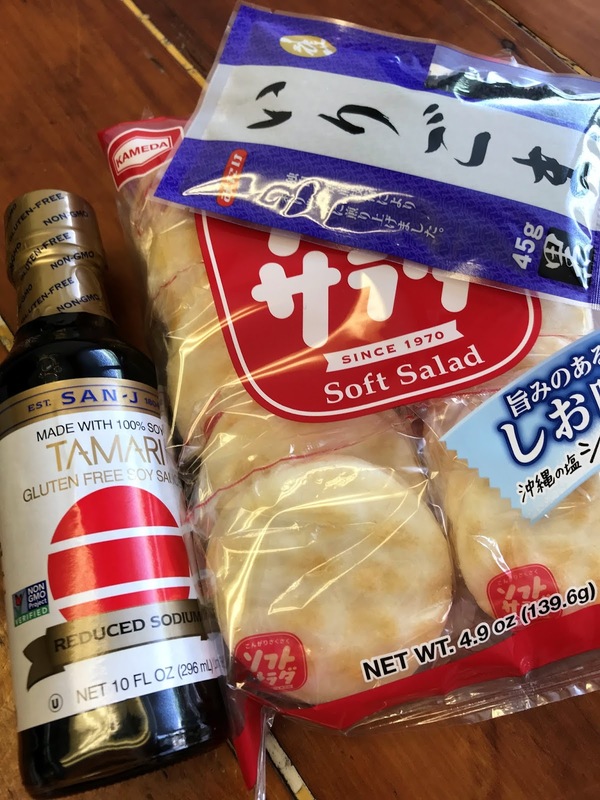 I hit the local Japanese grocery store again last week, and yippee! I found a supply of 'Soft Salad', my fave ricey snack. Along with some salt reduced, gluten free tamari, and black sesame seeds that I was hunting around for without success. Thank goodness they had a supply, so now I can make that salmon salad I've been planning for a while. 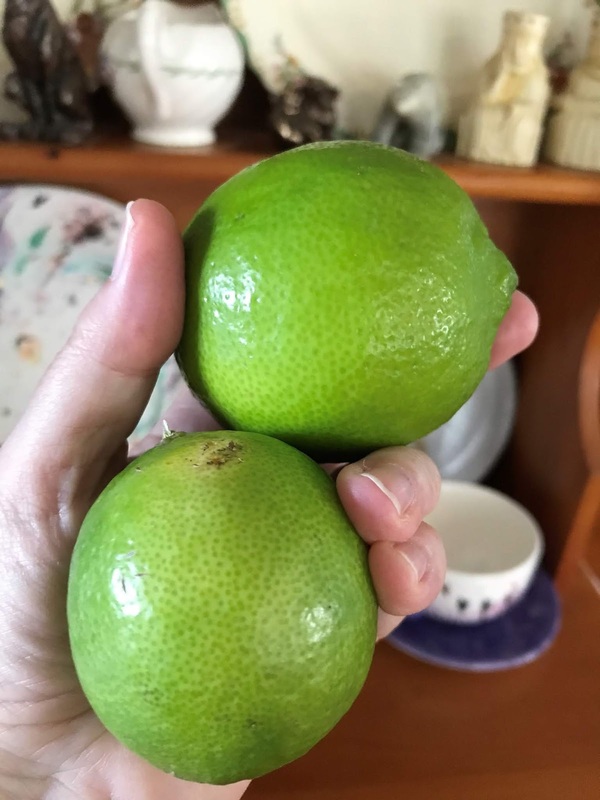 A friend who lives nearby gave us some fresh limes, straight off the tree. I didn't know that limes can grow well in sub-tropical climes, but clearly they can and do! Well, that's it from me for this month's IMK post. Please feel free to join in; we all love to share what's happening in our global kitchens. So come along! Here's how you too can join in with your IMK posts. Everybody is welcome! Addendum to links for IMK: Inlinkz has changed its method due to the new EU data protection law, so I can no longer add links for other people. So, I will still have the inlinkz option up, but you have to either verify yourself through social media or create an inlinkz log-in. I think you only have to do that once! I will also have a list of posts for those who don't want to log-in, so either comment with your details on this post, or you can email me with your post details and I will add it to the list. 2. Comment on this post, providing a link to your post so I can add it to the list below. All your Japanese spice blends are very interesting, and I'm sure I would love the tastes of them. Enjoy your new refrigerator! I tried addressing my kitchen post this month to a global problem: what to do with all the packaging and stuff that comes into our kitchens and has to go somewhere! I'd love to hear what other bloggers have to say about this. Wow. So many cool things. First of all, what a great experience in London (back in the day). 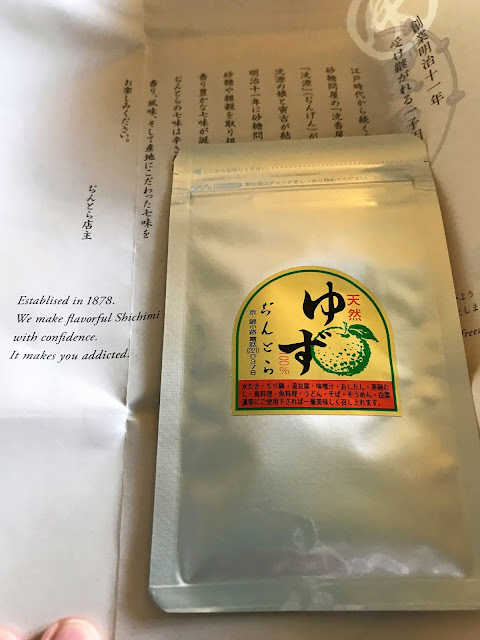 I love the graphics on the Japanese spice mix and LOLed at the confidence statement on the other package. 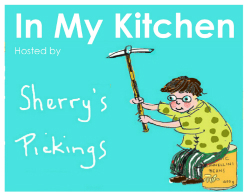 I am a fellow cookbook junkie, Sherry! Wow. This cereamic bowl looks amazging. adore the Japanese products and very intrigued by the soft salad thing - I bet I can find it in one store in town.. I shall stop by! thanks for hosting IMK, always a great fun! thanks sally for dropping by. Yep soft salad are great - really crunchy and salty and tangy. my fave! I can see that you will be eating a lot of extra spicy and flavorful dishes in the future. I'm sure you are happy having a new fridge. Wow Sherry, I want to come and cook in your kitchen. 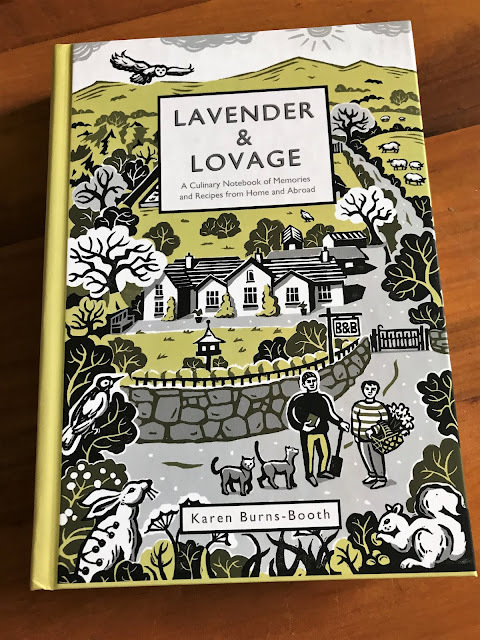 Karen's book is a wonderful addition to anyone's cookery book library. That's a big bag of Shichimi we only get the small bottle here. I love that stuff on noddles. Have a lovely and hopefully cool autumn week. yes the weather has finally turned - at least for this week:) it is quite cool this morning Yay! Just a note, Sherry -- that last link is to a blog but no sign of an IMK post there. It's too bad when people do that just to get attention, and don't really join the community. thanks Mae. Yes i had noticed this phony link! so i will delete it, as it's just not fair to true bloggers who do real posts. thanks for the headsup. oh no how awful to get a cold at this time of year. It's actually cool this week. Yay! Wow lots of chilli and japanese treats - I think I prefer the japanese but am bamboozled by soft salad. 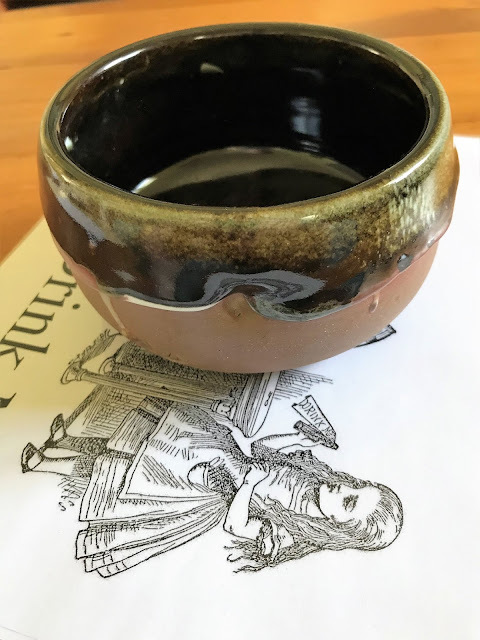 Love that new bowl and your new cookbooks - I seem to have so little time for cookbooks I am buying them less though both of those look wonderful. Love spices -- you have some neat ones. And a new refrigerator! Always fun -- and yours looks like al beauty. I am looking forward to some dishes with those Japanese spices, they sound very interesting. Congratulations on the new refrigerator, sounds like there is a story behind the demise of the old one. And, I do love bowls, you have a great one there. Thanks for hosting IMK. I finally got around to doing a post, I do enjoy them all. Sherry, love the spice mixes and that chili fudge is intriguing! The Sit Still Lauren bowl is gorgeous! yes i really love that bowl. it is such a beauty. I also have too many recipe books for the shelves! 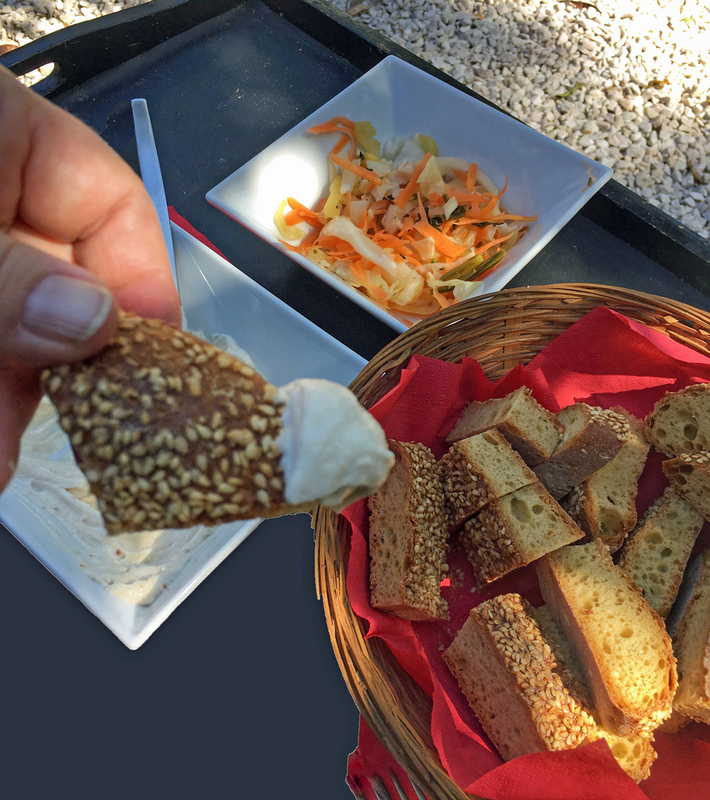 I have never seen black sesame seeds but have a few recipes that need them. Another thing to add to my overseas shopping list. i had to go to the japanese store to get them, as they weren't anywhere else. weird little things. should be good in the salad. I am liking what is in your kitchen. I love shopping at Asian markets and making great discoveries. And fresh limes from a neighbor’s tree! What I’d give for that! Those Japanese spices look really cool, and how great is it to get fresh limes straight from the tree! I have also added my link. Have a nice April, hopefully it won't get too busy with all the events! It's all aabout the books for you this month, isn't it? And such lovely covers. I loved Mirka's accent. An immigrant accent that had broadened and melted into the Australian accent over the years. I got some limes from my boss just the other day. She had an Easter Basket set up in her office but instead of chocolate eggs, it was full of home grown limes. Goodness, Blogger can be picky! I left you a comment bu have no idea if you got it. Just ignore this one if you did. Good morning from Florida! I am linking up this month but I had trouble uploading a photo for some reason. It's always cool to see what you have in your kitchen around the world from me. Loving the Japanese spices. I like your new fridge too. 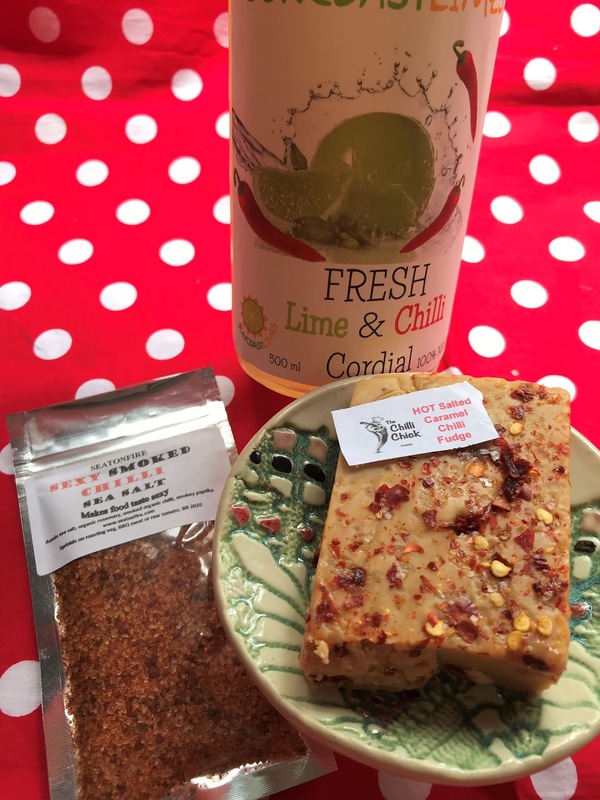 I am in admiration of all the things in your kitchen this month - your finds at the chilli festival. I esp. like Japansese spices that have me excited, so lovely packaging too. 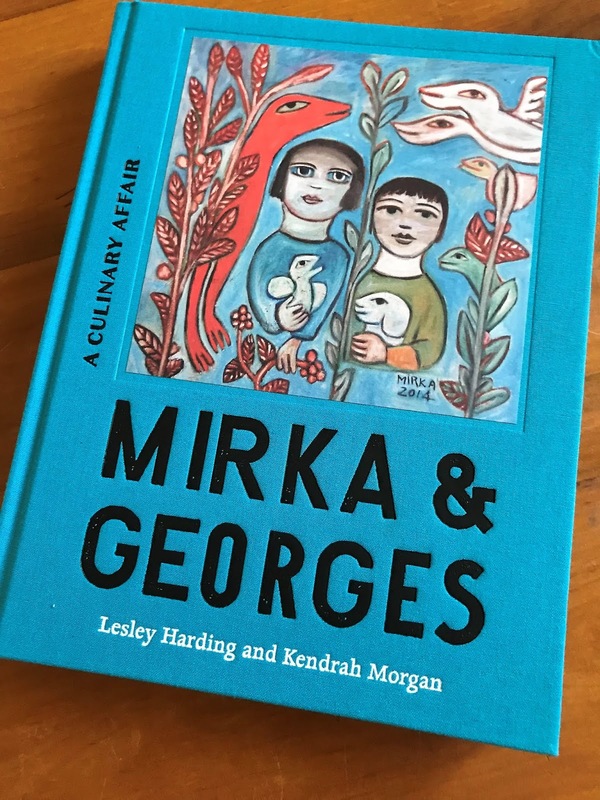 OOh keen to know more about the Mirka and Georges cookbook as you know I too am a fan of cookbooks esp. those with a story! And like JOhanna I am bamboozled by the soft salad ?